I got a call not long ago from a reader seeking Laotian food. “None that I know of in Charlotte,” I said sadly. A month later, JP to Go pops up on my Facebook feed. Bingo! So what kind of food comes from Laos? Look at a map southeast Asia and you’ll find Laos nestled between Vietnam and Thailand. 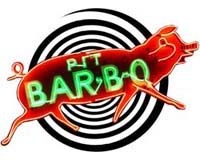 If you like either of those cuisines, you’ll enjoy discovering what JP to Go has to offer. 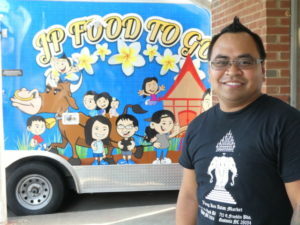 Johnny Vong shows off his food truck’s cartoon mural – his nieces and nephews frolic on a water buffalo in the yard of a traditional house in Laos. Johnny Vong and wife Pone Naovarath, both in their early 30s, started JP to Go in 2017. They park their bright blue trailer next to her parents’ V & K Asian Market, 2626 Little Rock Road just off Interstate 85 near the airport. Naovarath’s family came to the U.S. as refugees from Laos after the Vietnam War. Their store specializes in fresh vegetables from southeast Asia, attracting customers from far beyond Charlotte. 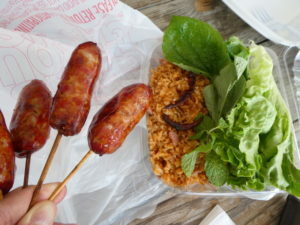 You can get the sausages in a combo with what the menu lists as “pork fried rice.” It’s actually a Lao favorite called nam kao, crunchy rice tossed with onion, peanuts and bits of ham. Or craft your own combo by ordering pad thai, a robust Lao version of the familiar noodle dish found at Thai restaurants. While you wait the ten minutes for your to-go box you’ll usually have lots of company — non-Asian warehouse workers, bodybuilders from a nearby gym, a carload of Asian high school kids, an Asian businessman in a suit and tie, all on one recent day. 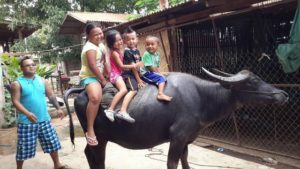 Johnny Vong with nieces and nephews frolic with a water buffalo on a visit back to Laos. Vong family photo. Monday – Saturday Noon – 7 p.m.